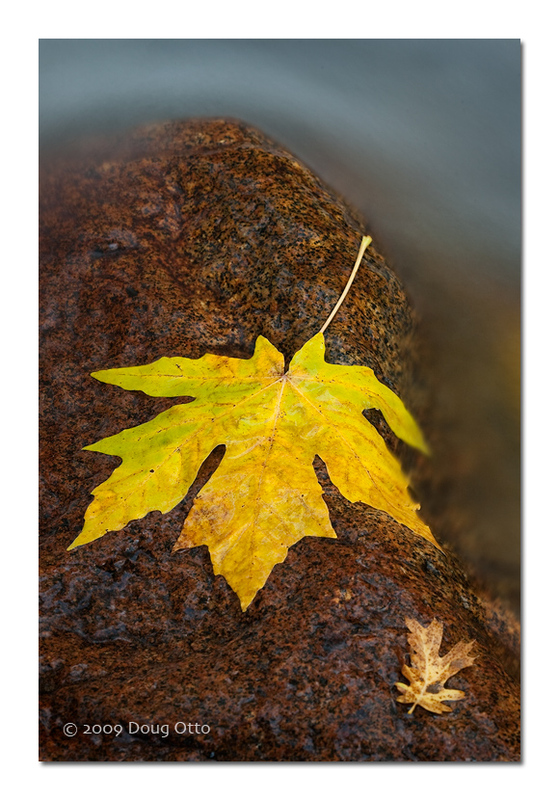 Water, granite and yellow leaves; the essence of fall in Yosemite. I talk about it quite often but it’s really easy to get caught up in “the big picture” in a place like Yosemite. Honestly, for many first time visitors, looking past the giant looming granite walls, the huge water falls and wide open meadows is next to impossible. Traditional thinking leads you to believe that landscape photography requires wide angle lenses, a [wikipop]hyperfocal distance[/wikipop] chart and a complicated array of filters. All of those items certainly have their place in any landscape photographers tool kit, but none are essential to the making of successful images. I’m not immune to being “sucked in” by the classic scene but lately I’ve been making a more conscious effort to break down scenes into their component parts. Not unlike trying to determine a recipe just by tasting a finished dish, it forces me to step back and feel the image versus just seeing it. The result of the exercise is an image that I’m more emotionally connected to. My hope is that connection translates to a similar experience for you, the viewer of image. This pretty little scene was captured using my Canon 100-400, zoomed to 190mm. To maintain sharpness throughout the frame I chose f/16 as my aperture. I generally like to leave my ISO at it’s lowest setting, which is 100 on this camera. That combination resulted in an exposure of 13 seconds. This entry was posted in Photography and tagged bridal veil creek, Canon 100-400, Canon 5D, doug otto, fall color, granite, Landscape Photography, water, yosemite, yosemite national park. Bookmark the permalink.